Bad Mister introduces us to the next lesson in leveraging the power of the MODX - using the Part Assignable Knobs. The previous examples were showing how to use the Assignable Knobs of the Performance Parts for building Super Knob assignments. Independent of the Super Knob use, you can use the Part Assignable Knobs for individual assignments, which are used after *selecting* the Part. (Please note: The Live Set that is used in the Mastering MODX series is located here). Important: You can control only one Part at the same time with Part Assignable Knobs (the currently selected/highlighted PART). But you can use the Super Knob and the Assignable Knobs of the *selected* Part at same time! This example shows how Super Knob assignments can be combined with individual assignments to the Part Assignable Knobs, which have not been linked to the Super Knob. Getting your head around this may take some time, but before there was a Super Knob, an Assignable Knob would be assigned to control a specific parameter within the current PART. This can still be done, and it remains unaffected by the movement of the Super Knob for this PART. Often a PART in your PERFORMANCE may be selected (highlighted) for individual direct play/control, while the others are responding to messages generated by the Arpeggiators. For example, you might have a two-Part split Performance, a lead sound in the right hand and a bass in the left; you might want to have a knob that just affects the lead Part. In such a case you may opt to simply use the Assignable Knob independent of the Super Knob movement. Each PART, when selected for *direct* play/control, has access to the four rows of four Knob functions plus its own eight Assignable Knobs. In effect, you have 24 Knobs, plus the physical controllers (MW, PB Wheel, the two Assignable Switches, FC1/FC2, Faders (Control Sliders), the Motion Sequences, Arpeggios, the Envelope Follower, etc., that can all be called upon while this Part is selected. An extensive Receive Switch matrix allows you to determine which physical controllers are active per Part, thus making your performing work as you deem necessary. Between the Super Knob which can work independently, and the controls available to your currently highlighted (selected) Part, you can design most any scenario. Translation: In the previous examples of the SUPER KNOB assignment, we saw how on the Performance upper "COMMON/Audio" level you needed to assign "Part 1 Assign 1", "Part 1 Assign 2" and so on, to make each Knob accessible via the Super Knob. In this example, only these first two are using the Super Knob. The other six Part Assign Knobs are individually accessible when you highlight/select the PART, as we'll see below. (This is very similar to the Motif XS/XF Performance where when you directly *selected* an individual PART, the Assign 1 and 2 Control Knobs would address just that individual PART parameters). 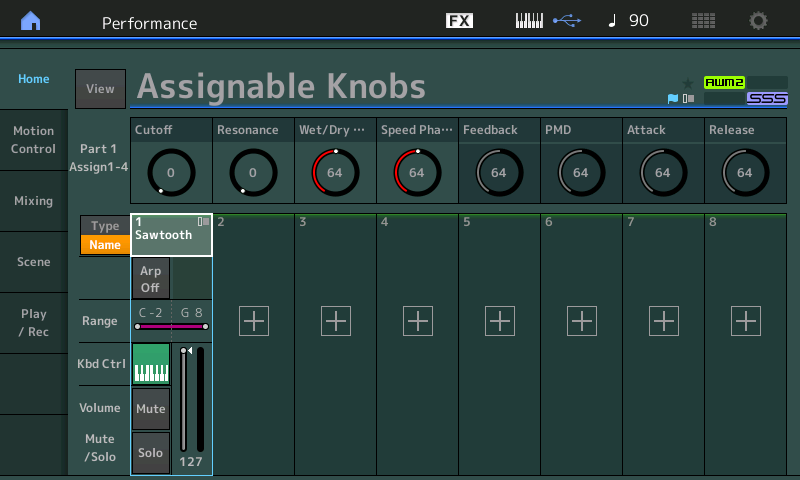 On MODX you have 8 Assign Knobs per Part and they can be used, directly when performing. To view the Assignable Knob layout go to the OVERVIEW screen: [SHIFT] + [PERFORMANCE (HOME)] or from the main screen touch "MOTION CONTROL" > "OVERVIEW". Above you see the two Assign Knobs that are linked to the Super Knob. Above you can see that Part 1 Assign Knobs 1-4 are active. Press the [ASSIGN] button (Flashes) to reveal that Part 1 Assign Knobs 5-8 are also active. There is one DESTINATION parameter assignment to each of the PART's eight Assignable Knobs. To view the actual 8 Destination Control Settings use the "Edit Part 1 Control Settings" shortcut. Set the DISPLAY FILTER to "ALL". You can view Destination 1 ~ Destination 4 on the first Page. The Super Knob starts with the center position (64). This is useful for combining with the use of Part Assignable Knobs, which are set to center position by default. For this reason, selecting Bipolar (Polarity) for all assignments in the Part Controller Box is needed: Bipolar allows you to move the parameter up or down depending on whether a Positive or Negative value is set for RATIO. Positive values increase as the Knob is turned clockwise. The Assignable Knobs can be used for controlling the listed eight parameters: Cutoff, Resonance, Insert "A" Dry/Wet, Insert "A" LFO Speed, Insert "A" Feedback Level, Element LFO Pitch Modulation Depth (vibrato), AEG Attack, AEG Release. At the same time you can use the Super Knob, which controls the Assignable Knobs 1+2. But you should avoid using the Super Knob and the Assignable Knobs 1+2 at same time, because they are controlling the same parameter. When PART 1 is highlighted (shown below) on the Home screen, you can see the movement caused by the Super Knob’s control over the Assignable Knob 1+2, “Cutoff” and “Resonance”. I've edited and stored this PERFORMANCE renaming the individual Destinations for this PART (PART 1) (DISPLAY NAME). By default, they are simply named: Assign 1, Assign 2, Assign 3, Assign 4 and so on. When you *select* the PART, Part 1, the name you provide as the "Display Name" will appear - very useful when performing to know what your assignable knobs are going to do (select the Part by touching the TYPE/NAME box above PART1) – Now you will see that I've identified what each of them is doing to PART 1. Because you can SELECT only one PART at a time, it makes total sense to be able to read what that Knob is assigned to (this cuts down immensely on the guessing about what a Knob is doing!) It appears that many of the PRESETs have the word "Assigned" simply as the PART "Display Name" – which at least lets you know it is doing something – if it is not assigned the Display name area appears blank. Hint: From the upper COMMON/Audio level (or when the PERFORMANCE NAME is highlighted) the KNOBS will simply read ASSIGN 1 – ASSIGN 8. When you select an individual PART, you have the option of viewing the KNOB assignment by what it is doing. You can even give it a "nickname" – it can be anything that you wish. This is extremely cool because you can be descriptive. The Presets only indicate with Knob is "Assigned" when you select an individual PART. Imagine the PART Knob is controlling an FM Element that causes RING MODULATION when you raise its Modulation Index (Output Level) saying it is "Output Level" is not as helpful as naming it "+RingMod". So selecting any single PART (so that it is the highlighted PART) will show you what each of the knobs is assigned to control. This can be very useful and can make exploring Performances much easier because when scuba diving, it can get quite deep! Catch up on the previous article in the series: "Mastering MODX 7: Super Knobs Values”. Next article now available: "Mastering MODX 9: Controller Box Switches".